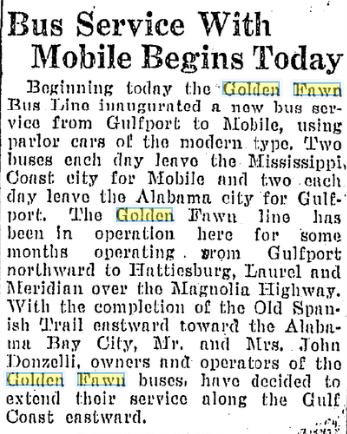 John Donzelli [1888-1950], native of Sicily, and spouse Mabel Roberts [1900-1982], born in Wisconsin, operated the Golden Fawn Bus Line for several years at Gulfport. They were victims of the Depression and lost their Gulfport home and in 1929 relocated to Indianapolis where John cleaned busses for Greyhound. Lucy,a daughter, was born at Gulfport in August 1927. The Biloxi Herald, “Electric Lights”, November 5, 1892. The Biloxi Herald, “Lights for the town”, September 30, 1893. The Biloxi Herald, “Progressive Biloxi”, March 16, 1895. The Biloxi Herald, “The City Railroad”, March 30, 1895. 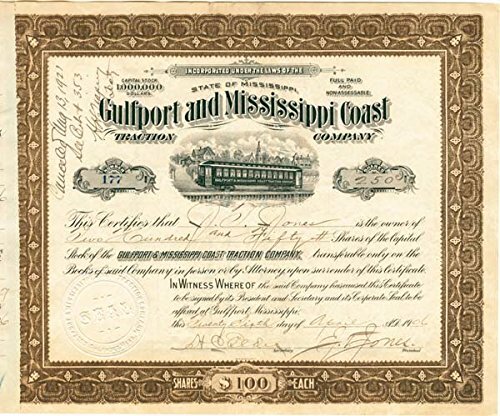 The Biloxi Herald, “Charter of Incorporation of the Biloxi City Railroad Company”, April 20, 1895. The Biloxi Daily Herald, “City Council”, January 8, 1902. 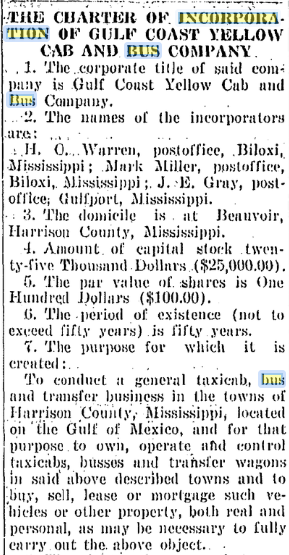 The Biloxi Daily Herald, “Stock taken”, November 15, 1902. TThe Biloxi Daily Herald, “The Charter”, December 18, 1902. 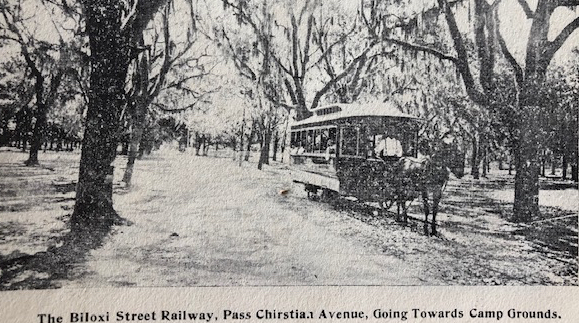 The Biloxi Daily Herald, “Electric Street Railway”, January 16, 1903. 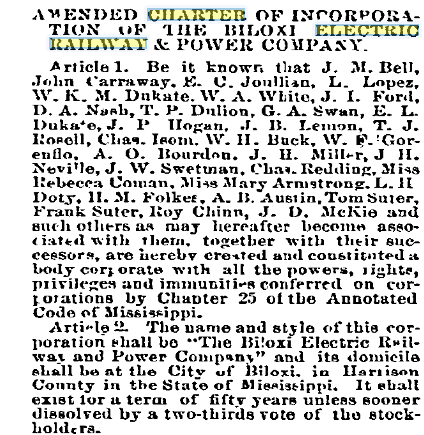 The Biloxi Daily Herald, “Biloxi Electric Railway Company”, February 24, 1903. The Biloxi Daily Herald, “Damage suit”, June 17, 1903. The Biloxi Daily Herald, “Big Brick deal”, July 3, 1903. The Biloxi Daily Herald, “Biloxi for Biloxians”, July 3, 1903. The Biloxi Daily Herald, “Biloxi for Biloxians”, July 6, 1903. 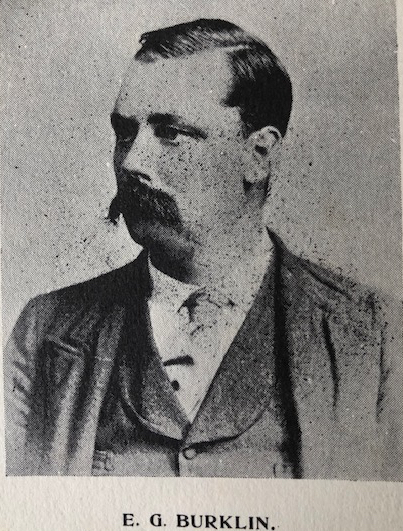 The Biloxi Daily Herald, “City Fathers”, July 8, 1903. The Biloxi Daily Herald, “Biloxi for Biloxians”, July 9, 1903. The Biloxi Daily Herald, “The silver spike”, August 13, 1903. The Biloxi Daily Herald, “City News”, September 3, 1903. The Biloxi Daily Herald, “Want a receiver”, September 4, 1903. The Biloxi Daily Herald, “Fountain to be moved”, September 9, 1903. The Biloxi Daily Herald, “City Items”, October 13, 1903. The Biloxi Daily Herald, “City Items”, October 19, 1903. 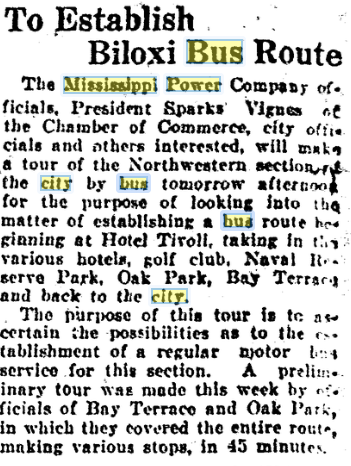 The Biloxi Daily Herald, “Let us have an electric line to Biloxi”, November 25, 1903. The Biloxi Daily Herald, “The cars”, December 15, 1903. The Biloxi Daily Herald, “Money makers”, March 25, 1904. 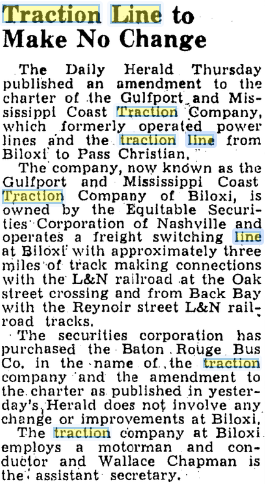 The Biloxi Daily Herald, “Work on Coast railway to begin”, July 4, 1905. 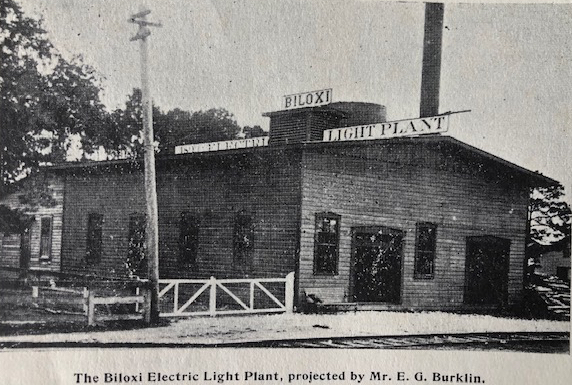 The Biloxi Daily Herald, “Electric plant sold to Jones" July 7, 1905. The Daily Herald, “[E.G. Burklin] Wants to hear from Biloxi”, March 4, 1911. 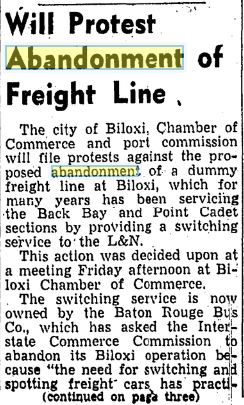 The Daily Herald, “Biloxi promoter [E.G. Burklin] of 1893 writes”, October 4, 1919. The Daily Herald, “Eaton makes statement”, January 2, 1926. 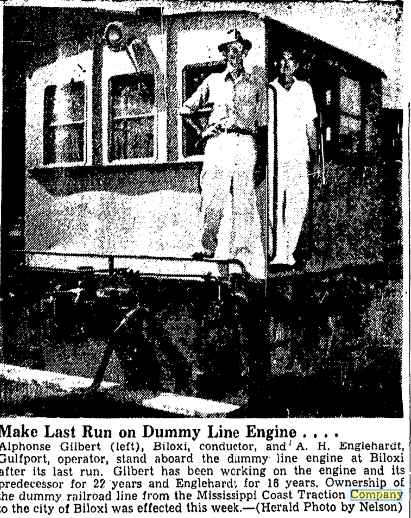 The Daily Herald, “Tech [sic] Bus Line will not take up Coast passengers”, October 13, 1927. The Daily News, “Power line to Coast included in companies program”, March 28, 1926.